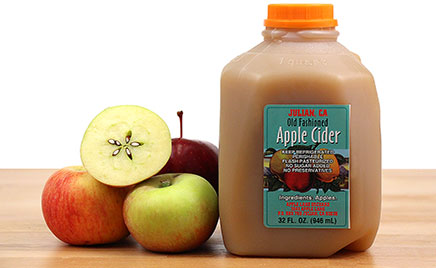 Apple cider from Apple Lane Orchards is located in Julian, California. The cider includes four to five different sweet and tart apple varieties including: Gala, Fuji, Red Delicious, Golden Delicious and Granny Smith. Apple cider form Apple Lane Orchard has no added sugar, no preservatives and is flash pasteurized. This cider offers a sweet flavor and creamy texture.